They are self-professed word nerds. Their numbers include former President Clinton, Jon Stewart, the folk-rock duo Indigo Girls and New York Yankees pitcher Mike Mussina. Their idol is a guy named Will Shortz. Crossword puzzles and the people who love them are the subject of the lively documentary "Wordplay," which premiered over the weekend at the Sundance Film Festival. Shortz is the pastime's key figure, The New York Times crossword puzzle editor who's also heard on public radio. "He's the ambassador of the crossword puzzle world. He's really the pinnacle of this community," Patrick Creadon, a cinematographer making his directing debut with "Wordplay," said in an Associated Press interview alongside Shortz. 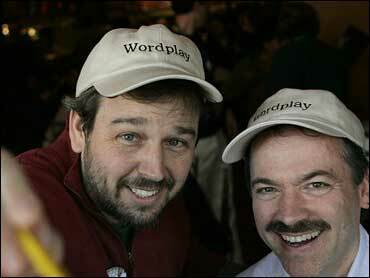 Playing the festival in search of a theatrical distributor, "Wordplay" proved to be a crowd-pleaser in its initial Sundance screenings, with potential to capture the sort of commercial audience that made hits out of such documentaries as "Spellbound" and "Mad Hot Ballroom." The film uses Shortz's career as a focus, from his love of puzzles as a boy, to the creation of his own academic major — "enigmatology," or the study of puzzles — at Indiana University, through his professional work and his shepherding of the American Crossword Puzzle Tournament each year in Stamford, Conn.
Creadon and his wife, producer Christine O'Malley, also feature rank-and-file puzzlers, colleagues who help Shortz create the Times crosswords and lovably fierce tournament competitors. Ellen Ripstein, the 2001 tournament champion, calls herself a "little nerd girl," but she doesn't mind firing back when people mock her passion for crossword puzzles. "I had a boyfriend once who would kind of put me down, and I'd go, `Well, what are you the best in the country at?"' Ripstein said. Shortz said the film has left him pleasantly puzzled at how crosswords resonate emotionally with people. "Crosswords are such a cerebral thing, you don't expect it to have so much emotional connection with people. But this movie is funny, you laugh a lot, there are touching moments, people crying. It's exciting. You usually don't associate crossword puzzles with excitement, but every time I watch this movie — and I've seen it four times — every time I watch it, my hands get clammy and I start to sweat." Sundance crowds were so caught up in the film's footage of last year's crossword tournament that viewers groaned over a bitter agony-of-defeat moment in the dramatic finale. The same passion is captured with everyday players. "The Daily Show" host Stewart is seen assaulting the Times crossword, shouting "Come on, Shortz! Bring it!" Indigo Girls Emily Saliers and Amy Ray note they felt they had truly arrived when they were included in a Times crossword. Mussina says he takes a Times crossword as far as he can then calls on the bullpen, getting teammates to help him finish. Mr. Clinton relates how the Times crosswords would give him a moment to relax and take his mind off his White House job. "Wordplay" recounts the Times' clever clue — asking for tomorrow's headline — on the eve of the 1996 presidential election. The puzzle was constructed so it could be solved as either "Clinton elected" or "Bob Dole elected." Dole was not an avid puzzle fan himself, but Creadon managed to land an interview with him for "Wordplay." "So that's how we got Bob Dole to be in the movie, was that Bill Clinton called him." While Shortz said crosswords are a way to give people a mental workout, it's their fun quotient that makes puzzles so worthwhile. "I like entertaining people, and crosswords are sort of a quiet way to entertain people," Shortz said. "I don't stand on stage and tell jokes or sing or do a magic act. I create and edit these puzzles, send them out into the world, and a couple of weeks or months or years later, I get feedback from the audience. "The other thing I like about crosswords are the people. I don't know whether crosswords attract nice people or crosswords bring out the natural niceness of people, but you can tell from the film that crossworders are ingratiating and just people you want to know."